The CYBEX 625T is a value-packed treadmill that delivers the performance features clubs need to keep members happy and business healthy. For colleges and universities, this treadmill is designed to encourage serious and casual fitness athletes alike to rediscover the simple joys of running, jogging, and walking. The CYBEX 625T is engineered to provide better stability and greater comfort than the competition. Heart Rate Monitoring-Heart rate can be monitored from either the contact grips or hands free from a wireless heart rate transmitter. See it at a glance with a multi-colored LED that displays a different color for specific target heart rate zones. Take Control-The 625T’s user centric design features Speed and Incline buttons right where they belong – in a centralized easily accessible place next to the contact heart rate grips. Split Level Display-The console itself is designed to match the way a treadmill is used. By separating the console into two parts, we’ve given users the ability to use what they want and when. Metrics are at eye level while controls are closest to the users natural hand positions. Custom Colors-Why stick with silver grey when there are five standard colors (white, black, platinum sparkle, metaltone gold, black chrome) to choose from? Or … select from over 180 custom colors to match any decor. Only CYBEX offers color customization in CV and strength equipment. Safety Sentry-Knows whether you are there or not and will stop the belt after the pre-selected waiting period helping to keep users safe. P.S. Don’t forget to use the Safety Lanyard. ToughTrain 4.0 out of 5 This treadmill have numerous useful features that motivates you for the longer workout. It costs bit more but can get a strong and reliable machine. *Note: Most of the sites, stores or shopping portals listed above sell Cybex 625T Treadmill with discounts and other exciting offers. There is a possibility that the some of above websites are not selling Cybex 625T Treadmill now. Toughtrain.com is not liable for such cases or instances. 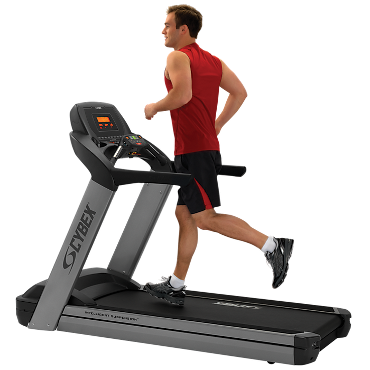 Also we do not recommend any seller for Cybex 625T Treadmill and a buyer should buy from where he/she gets best deal with quality of products, service and on time delivery (shipment).